Earnings season in full swing; China GDP; New market records? 1. Earnings bonanza: A mix of financial services, entertainment, transportation and technology companies are reporting earnings this week. Investors will be examining earnings from BlackRock (BLK) ahead of the open on Monday. Netflix (NFLX) will report after the close. Later in the week financial firms including Goldman Sachs (GS), Bank of America (BAC) and Morgan Stanley (MS) will report results. 2. Chinese growth: New Chinese government data show the country's economy grew 6.9% in the second quarter, the same pace as the previous three months and marginally higher than most forecasts. Beijing announced last week it would change the way it calculated economic growth for the first time in 15 years, adding healthcare, tourism and the "new economy" to the overall figure. It was not immediately clear whether those additions had an impact on growth. The latest numbers could reinforce skepticism among analysts about the reliability of official statistics. "We have doubts over the accuracy of the official figures, which point to implausibly stable growth," Julian Evans-Pritchard of Capital Economics wrote in a research note Monday. Economists often use other measures such as electricity output and freight shipments to gauge the country's economic strength. 3. Stock market overview: New U.S. stock market records are in sight on Monday. Both the Dow Jones industrial average and S&P 500 hit record closing highs on Friday. 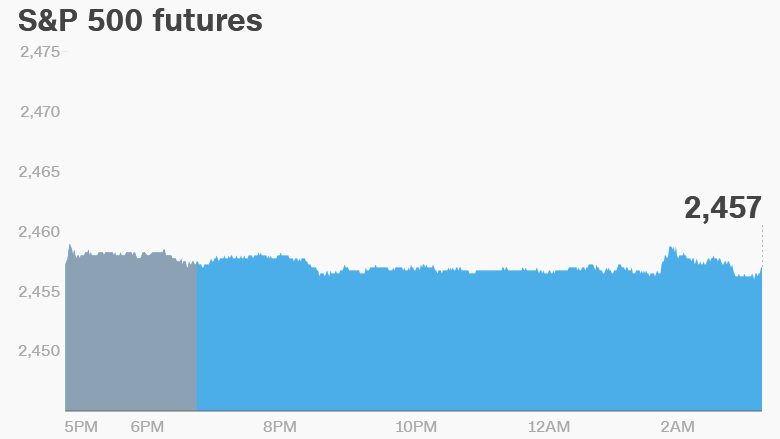 U.S. stock futures indicate stocks could edge up a bit more when trading begins. European markets were mostly positive in early trading. Asian markets ended the day with mixed results. China's Shenzhen index had a particularly bad day with a 4.3% drop. 4. Brexit talks: U.K. and European Union officials are kicking off a second round of Brexit talks on Monday. Negotiations will center around the rights of millions of citizens who have settled in Britain or Europe, nuclear agreements and the U.K.'s so-called divorce bill.